Equestrianism, more often known as horse riding or horseback riding, refers to the skill and sport of riding, driving, steeplechasing or vaulting with horses. This broad description includes the use of horses for practical working purposes, transportation, recreational activities, artistic or cultural exercises, and competitive sport. Gdańsk is a Polish city on the Baltic coast. 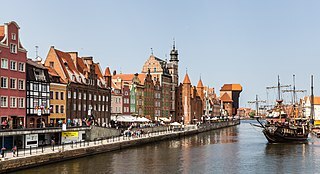 With a population of 464,254, Gdańsk is the capital and largest city of the Pomeranian Voivodeship and the capital of Kashubia. It is Poland's principal seaport and the centre of the country's fourth-largest metropolitan area. Axel Cäsar Springer was a German journalist and the founder and owner of the Axel Springer SE publishing company. Reiner Klimke was a German equestrian, who won six gold and two bronze medals in dressage at the Summer Olympics — a record for equestrian events that has since been surpassed. He appeared in six Olympics from 1960 to 1988, excluding the 1980 Games that were boycotted by West Germany. Theodora Elisabeth Gerarda "Anky" van Grunsven is a Dutch dressage champion who is the only rider to record three successive Olympic wins in the same event. Along with her Olympic successes, she has won numerous medals at the World Equestrian Games (WEG), and is the only rider to have competed at every WEG since they began in 1990. Between 1990 and 2006, she competed at the Games in dressage, but in 2010 she was named as part of the Dutch reining team, marking a major change in discipline. Debbie McDonald is an American dressage rider who has competed in the Olympics and many international competitions. She now lives in Hailey, Idaho, with her husband Bob, a hunter/jumper and trainer. Debbie trains and teaches riders on Peggy and E. Parry Thomas's River Grove Farm in Sun Valley, Idaho. Isabell Werth is a German equestrian and world champion in dressage who competed in the Olympics five times winning ten medals, six of them gold. She holds the record for the most Olympic medals won by any equestrian athlete. Nicole Uphoff is a German equestrian who competes in the sport of dressage. She won four gold medals in individual and team competition at the 1988 and 1992 Summer Olympics. Riding her star horse, Rembrandt, Uphoff also won numerous other international competitions, including the World Equestrian Games and the European Dressage Championships. Jane Gregory, was an international equestrian. She first rode for her country in 1994, competing in the World Equestrian Games of that year, and competed for Great Britain in Dressage at the Atlanta and Beijing Olympic Games. Ingrid Klimke is a German eventing rider. She appeared at five Olympics from 2000 to 2016. With her horse Abraxxas, she won two gold medals in team eventing at the 2008 Summer Olympics and the 2012 Summer Olympics. At the 2016 Summer Olympics, she won a team silver with Hale-Bob. Ulla Salzgeber is a German equestrian and Olympic champion who competes in the sport of dressage. Competing in the 2000 and 2004 Summer Olympics, she won two team gold medals, one individual silver and one individual bronze. She also won numerous medals at the World Equestrian Games, Dressage World Cup and European Dressage Championships. After the retirement of her Olympic horse, Rusty, after the 2004 Games, and unexpected death of her second international-level mount in 2005, Salzgeber struggled to find a new Grand Prix-level horse. Christilot Hanson-Boylen is a Canadian equestrian who competed as a member of the Canadian Equestrian Team in Dressage at six Olympic Games. Laura Tomlinson MBE is a German-born British dressage rider competing at Olympic level. As of 30 June 2012 the Fédération Équestre Internationale (FEI) ranked her 3rd in the world riding Mistral Højris and 36th on Andretti H. In that year, Tomlinson, riding Mistral Højris under her maiden name of Laura Bechtolsheimer, won two medals in the 2012 Summer Olympics in London; gold for Great Britain in the team dressage with Carl Hester and Charlotte Dujardin, the first ever Olympic team gold in the discipline for her country, and bronze in the individual dressage behind gold medalist and compatriot Dujardin. Bonfire, full name Gestion Bonfire, was an Oldenburg gelding that competed in dressage with Dutch rider Anky van Grunsven. Between 1991 and 2000, the pair competed in multiple national and international championships, including three Olympic Games and two World Equestrian Games. They won one gold medal and four silver medals at the Olympics and one gold and three silvers at the World Equestrian Games. Although known for having a hot temperament, Bonfire mellowed as he aged, becoming one of Van Grunsven's best horses – until she found his replacement, Salinero, she did not think she would ever find a horse to match Bonfire's talent. A statue of Bonfire stands in Van Grunsven's home town of Erp. Uwe Schulten-Baumer, nicknamed "Der Doktor", was a German show jumping and dressage rider who became an internationally famous dressage trainer and coach who worked with Nicole Uphoff and Isabell Werth, who won 4 and 5, respectively, Olympic gold medals in individual and team dressage. Charlotte Susan Jane Dujardin, is a British elite dressage rider, equestrian, and writer. The most successful British dressage rider in the history of the sport and the winner of all major titles and world records in the sport, Dujardin has been described as the dominant dressage rider of her era. Mary Hanna is an Australian equestrian. She represented Australia at five Olympic Games in the equestrian discipline of dressage. 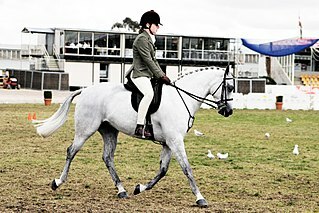 Kristy Oatley-Nist is an Australian equestrian. She represented Australia at the 2000, 2008, 2012 and 2016 Summer Olympics in the equestrian discipline of dressage. Lyndal Oatley is an Australian equestrian. She represented Australia at two Summer Olympics in equestrian dressage. Kristina Bröring-Sprehe is a German dressage rider competing at Olympic level. Beatriz Ferrer-Salat Serra de Migui is an equestrian from Spain who competes internationally in the sport of dressage. She won two Olympic medals, a silver and a bronze, at the 2004 Games, and also competed at the 1996 Summer Olympics and the 2000 Summer Olympics. She began riding in international competitions in 1995, and has since competed in the 2002 World Equestrian Games, winning individual silver and team bronze, and in several European Dressage Championships, where she has won several additional individual and team medals. Based in Spain, Ferrer-Salat continues to compete internationally, as well as acting as the chair of the board for the Spanish Dressage Riders Club. Belinda Trussell is a Canadian Olympic dressage rider. Representing Canada, she competed at two Summer Olympics. At the 2004 Summer Olympics in Athens, Greece she placed 9th in the team competition and 36th in the individual competition. 12 years later, she achieved 27th position in the individual event. Kelly Layne is an Australian Dressage rider and trainer. She planned on representing her country at the 2016 Summer Olympics in Rio de Janeiro. However, Layne was unable to compete in the Games due to an injury suffered by her horse, Udon P, forcing her to withdraw from the final qualifying event. While born in Australia, Layne is currently based in Wellington, Florida. Layne also helped found her own riding team, "Dream Team Dressage". 1 2 Gjerde, Arild; Jeroen Heijmans; Bill Mallon; Hilary Evans (March 27, 2012). "Rosemarie Springer Biography and Olympic Results". Olympics. Sports Reference.com. Retrieved 2012-05-18. ↑ Köhler, Otto (2012-04-30). "Axel Cäsar Springer lebt". Junge Welt (in German). Retrieved 2012-05-18. 1 2 3 Bertke, Ellen (2012). "Olympia Dressurreiterin Rosemarie Springer" (in German). Markus Waterhues. Archived from the original on 2011-04-16. Retrieved 2012-05-18. ↑ Langmaack, Werner (2010-05-11). "Plädoyer für den Pferdewechsel bei der Dressur in Klein Flottbek". Die Welt (in German). Retrieved 2012-05-18. ↑ "Die Frau von der Insel und ihre große Liebe". Die Welt (in German). 2005-02-06. Retrieved 2012-05-18. 1 2 "Rosemarie Springer dies". Pikeur. Retrieved 4 April 2019.